-- GUNMAN'S WALK is another watermark in Karlson's career-long commitment to exploring the social circumstances in which acts of violence occur and the societal and psychological ramifications that swirl in their wake. Bert Convy plays Paul Chouard, a “half-breed” American Indian who is caught in a crossfire of fragile egos and tenuous identities on a western cattle drive. Chouard is laid victim to a racist and volcanically insecure Ed Hackett (Tab Hunter). Ed's wholesale neurosis and psychopathic pathology was bought and paid for in total by his father (Van Heflin), a hard-as-nails cattle baron whose very large footsteps he has been made to follow all his life on a road paved with emotional eggshells. -- namely, anywhere between Ed Hackett and something Ed wants; in this case, a wild white mare that Ed has sights on presenting to his younger brother Davey Hackett (James Darren). As both men pursue the rare equine prize, Ed runs Paul and his horse off the edge of a ravine and down into a sixty foot deep chasm thus allowing Karlson to execute a unique dual animal/man dummy demolition. -- which reveals both horse and man, now reconstituted as dummies for their horrifying plummet. -- that is, until Hackett takes another look at his handy work over the edge of the ravine. That is no dummy at the bottom of the cliff -- it's a very real human being that he has murdered in cold blood. This act of violence has its roots in several psychological facets that, as the story progresses, prove to be Ed's undoing and allude to the abstract constructions that animate him. Raised by his father to be his father's shadow while simultaneously living in his father's shadow, Ed is saddled with a wagon-load of spiritual contradictions that fuel his seemingly irrational behavior. Ed is the reflection his father casts backwards into both his father's youth and the youth of a once open, wild frontier that is now shrinking around them under the inexorable march of progress, law and civilization. Built by his father to function and thrive in an America that no longer exists, Ed is, himself, a rare breed -- a youthful anachronism. As an incarnation of his father's "Id" he is an impulsive, arrogant, hard drinking, gunslinging, womanizing cowboy who makes his own rules and poses a mortal threat to the new order of things thus dooming him to inevitable elimination. Van Heflin's Lee Hackett casts (aside from his own) a second reflection, this one into the future in the form of his son Davey. Davey Hackett serves as a personification of his father's super-ego and who is, as such, also a man of his time and of his country, if not of his family. The virginal Davey exists in opposition to his brother and that part of his father which his brother Ed represents -- eshewing drink, firearms, sexual promiscuity, bigotry and familial loyalty while embracing the imposition of an external construct of law and order and accepting the civic authority encroaching on their independent, heretofore solopsistic, way of life. Davey is ultimately burdened with the impossible task of reining in his rampaging brother and becomes an impotent witness to Ed’s inevitable destruction. -- his suppressed romantic muse as well (when fraternal, maternal and romantic love become intertwined in his mangled psyche). This confused miasma of repressed/displaced/combustble sexuality comes to a head in the above sequences inside and outside the ironically named "Gaiety Saloon" where Ed literally runs preferably into his brother's arms after an encounter with two lovely, tho entirely interchangeable young working girls. During the pivotal courtroom scene (wherein Ed's "guilt" or "innocence" in the "murder" of Paul Chouard will be determined) two iconic portraits adorn and bracket the judge's bench: one of President Lincoln on screen left and one of President Washington on screen right. These function as portraits of Lee Hackett's sons as well as bookends for the period of American history in which Ed and his father belong. Washington was a rebellious revolutionary and combat veteran who wrested America, by force of arms, from the hands of King George aligning him, here, with Ed. Abraham Lincoln was a self taught lawyer and statesman whose crucial role was that of national healer and uniter of the divided nation (in the wake of the jaw dropping carnage of America's Civil War) as well as staunch abolitionist -- all affinities shared with the character of Davey. After more patriarcal corruption designed by Lee to, once again, protect his son, Ed continues to rebel in the only manner he knows -- as that same tarnished reflection of an antiquated father. Something's gotta give and it finally does when Lee, despite his best efforts, is forced to confront and, finally, kill his own son. Ed's dying transformation is of a quadruple property: first, upon being disabled by his father's shot, Ed develops a respect for his father; second, at the moment of death, Ed is finally a man -- having stood up to his father; third, his death is a metaphoric transmutational absorption of Id back into his original host, Lee Hackett; and fourth, he becomes a corpse (but at least, a human one). Here, patricide takes the form of self-castration and emasculation as Lee removes his gun and belt and lets them slide to the ground while he grieves over the lifeless body of his favorite heir. In the broader thematic context of the story this amounts to a kind of national circumcision wherein a virile, independent (but destructive) element of national consciousness is (necessarily) amputated forever. It's a tale as old as the hills the ranchers ride through -- the fathers build on the sacrifice of the sons. In this instance, the sons are never more than ghostly projections of an ambivalent father. Lee Hackett is a man torn in two. Ed is now united with Paul Chouard in death - pulled into the vortex that he started spinning when his internal abstractions of competition, ignorance, love and greed moved him to kill. The "half-breed" Paul antagonized and blurred the clearly drawn but artificial racial borders placed in Ed's mind, necessitating the dehumanization of Paul (via transformation of actor Burt Convy into articulated mannequin) prior to the murderous act. The metamorphosis of dummy back into actor to depict the dead Paul allows the audience to share, with Ed, his brief glimpse of truth -- his own delusions broken and exposed on the rocks below. In death, Paul Chouard can no longer be dehumanized in Ed Hackett's eyes. Here a character's personal perception is revealed to him as a self-deception and is depicted for the audience, cinematically, with the illusion of prosthetic transfiguration and thus registered in Ed's fragile -- or perhaps developing -- conscience. 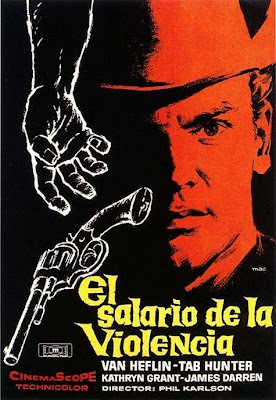 Note the apt Spanish title for GUNMAN'S WALK: "THE WAGES OF VIOLENCE". The spectral rider on this film's pale horse of death and truth could only be Phil Karlson, riding off into a very dark sunset. Your kind comment over in my ballyard reminded me to catch up on the doings in Destructible-land. My goodness! I'm probably most clueless regarding the western genre, and this is something I probably wouldn't have given a second thought. You've really opened it up for me however. I'm glad there was a dummy death to get it on your radar, because your breakdown of the balance of the film is making me put this on the must watch list. So much going on under the surface of these things, isn't there? Viva Macistes! Tab is "the Hunter and the Hunted"
and he's also the Hottie! 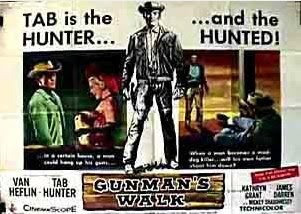 I gotta see this now because I love me some James Darren and with Van and Tad along for the ride I just know I'll enjoy this ambiguously gay western. To risk this becoming a couch session on the Merv Griffin Show...we thank you, Darrell for YOUR kind words. RANCID POPCORN is top-of-the-line. While there are MANY fine voices out there contributing to the current cinema blogosphere, yours is the least "judgemental" and self-applauding. It concerns itself with what riches one can find under the superficial crust and doesn't proclaim to be guilty for enjoying those riches. Superior job! Your last few entries especially. Kimberly -- Great to see you take time out from your continuously extraordinary CINEBEATS to join us here! 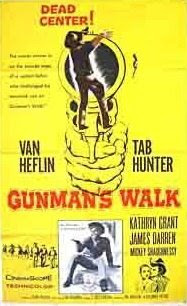 GUNMAN'S WALK is, without reservation, one of the finest westerns ever made. Frank Nugent is an unstoppable screenwriter and Karlson fits himself into the text like a hand in a privately tailored glove. This film wasn't made, it was BORN. It is dark, uncompromising, intimate, emotionally painful and absolutely gorgeous to look at. AND you get the ambiguously gay, narcissistic hot lunch buffet of Darren, Heflin and Hunter! It's currently available only on a Spanish DVD from Colombia. Go figure. I seriously enjoyed your analysis of this movie, however I stumbled upon it. However! May I respectfully point out- that the horse was called "a white MARE"-- a female. Technically, it was an albino, not 'white'-and I could not tell on the film whether it was in reality a mare. More likely a gelding-- since mare's would not rear up as in the film, as a rule. There is no such thing as a white horse, only shades of gray-as in Life. And, movies ARE artforms-- as subject to analysis and personal interpretation as any other art. If I were to view the film-I might take extra time to analyze the reactions/actions treatment of the women, since I am one; or of the Indians, since I am one, now that I claim it;or of the Spanish/Mexicans, since I married into that culture. Since I am also a horse person-I might take extensive time to analyse the treatment of the horses as portrayed in that artwork. True art can function as a mirror, letting you see truths about your self. They are not necessarily the same for everyone. When I first saw Rodin's The Thinker-I thought- hmm, he's having a hard time crapping. I myself struggle with that physiological issue. Did you see that? What do you see when you look at, say, Rodin's She Who Used to be the Beautiful Heaulmere"--excuse the spelling, please. From your anaylysis-- I would say that you are a gay man possibly non white-who had an overbearing controlling father figure. That I look at the Heaulmere statue-and see someone mourning the ravages of time upon my earthly body-I mourn, too. So you can figure out that I'm a post-menopausal female. When I watched Westerns as a child living in Arizona-- it just-- WAS. Fish who swim in the water rarely analyze the water-it just, is. I never analyzed the dynamic of the possible gay connotations-it was not in my comprehension at the time, nor was it upsetting that the folks were racist. It was just the way it was. See what I mean? Art is a mirror of self - but it is nice that you shared these, your personal insights about this artform. Um. I doubt that the pictures on either side of the judge's bench meant anything-- it was just the normal kind of thing to have on the wall of a government office. But, who knows? Like that sled- Rosebud- sometimes artsy folks do stuff on purpose. But I doubt seriously that Frosty the Snowman's carrot nose was a phallic symbol... as some have presumed. I do rather wonder where one would get a carrot in the dead of winter-and why that would be the only edible part of the snowman.But to quote someone -- W C Fields? -"Sometimes, a cigar is just a cigar". I do like your website and topics though- I love it that the movies used dummies at that time. Originally-they used to just use a real horse, a disposable one. I understand that movies have gone full circle-that some of the nastiest movies on the fringes are not done with special effects, but with real disposable people. Humans are so nasty, don't you think?